As can be imagined, an aerial parade above a capital requires a serious organization. Especially when it comes to the parade over Paris, for the occasion of the National Day. It is quite logical that, given the distances of some bases and units from the capital, a centralized meeting point is required. In the last couple of years, it has been the base of Evreux, located in Normandy, that welcomes the fighter aircraft of our French neighbors. By complacency, this year our team was once again present on the base in order to immortalize the participants of the July 14th air parade. Let's admit it, we were well aware that American planes were foreseen in the passes above Paris, to mark the centennial commemoration of the American presence in the First World War. We hoped to take some pictures of the Thunderbirds aerobatic team on F-16C / D, and the F-22 Raptor that came from the United States for the occasion, and also for the RIAT which took place the weekend following the National Day. But alas, the stars and stripes planes being based in Fairford, took part in the parade starting from their English base. Tough luck for us for being in this spot, but let's not sulk, as there was a host of Air Force aircraft that we were able to see from the Normandy base of Evreux. 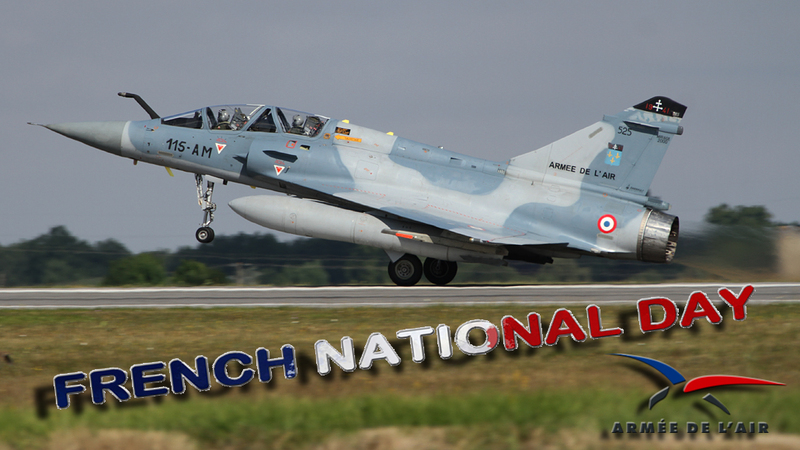 We are glad to be able to present a picture summary of this morning, which was made possible thanks to the support of the French Air Force, and the Evreux airbase authorities, whom we would thank warmly. 2.GC II/9 (Auvergne) markings Alpha Jet E (705-LJ) EAC00.314 "Christian Martell"